So you want to train a Chesapeake? Beneath that wavy double coat lies a steely determination to get the job done. So you think you’d like to train a Chesapeake? How hard can it be, right? After all, most likely, you’ve grown up around Labradors all of your life, possibly trained quite a few by now and you’d like the challenge of maybe trying something a little bit different? How different can a Chesapeake really be? You’ve heard they can be challenging, strong-willed and stubborn perhaps? but a firm hand should be able to sort that out, shouldn’t it? And apart from that fabulous dense wavy coat they look so similar to the traditional strong Labrador of what you remember from childhood that you know they will train just like any other retriever, right? ….and that my friend is where you will make your first mistake. Looks almost like a Labrador, so how different can they be? You see I’ve been there, done that, worn the T-shirt. 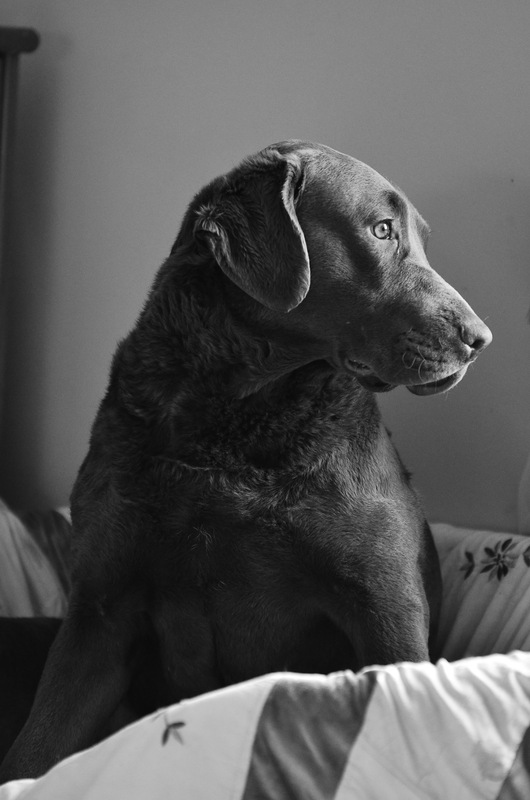 When our first Chesapeake came into our lives 13 years ago I truly thought we were just taking home a wavy coated version of a chocolate Labrador. I did all the right things, bored him to death by taking him to ‘proper’ gundog training from a young age where I followed instructions from those in the ‘know’ and he learned to sit in line for hours on end and learned to watch other dogs retrieve, take lines, be reprimanded physically and verbally for infractions such as running in or not returning quick enough. It wasn’t long before his Labrador peers that had started the same time as him were moving on to greater things, they had an aptitude for taking correction and direction stoically and without fuss. Trying to teach Chester in the same way produced drama, stubbornness and downright refusal. Simple things like telling him to enter a bramble patch to hunt for a dummy resulted in flat out refusal, yet he would hunt the ditches at home on the mere whiff of a rabbit or pheasant. In fairness to Chester, (and I commend him for this), in spite of all my nagging and pushing to a large extent he played along and did as I asked but the spark and drive that I saw when he hunted freely at home evaporated the moment I sat in line at a working test. He compounded what many, in Ireland, thought of Chesapeakes at the time….slow, ploddish and indifferent to dummies. Labradors, much more appeasing in general. There was something about all those curve balls he threw at me though that made me smile, no matter how much I tried to enforce my will on him he was determined to do it his way and I loved him for that. If you ever need a lesson in humility get a Chesapeake and run him in competition ‘cos sure as eggs he will find some way to bring you back to earth. The day I gave up trying to train Chester to become a working Labrador was truly the day my relationship with this breed moved into another level. I threw away the ‘rule book’ that says all retrievers can and will be taught in the same way, forgot any fancy notions of competing in working tests and went out and had fun with my dog. In training I allowed him ‘run-in’ on dummy retrieves. I let him parade and race round the field with it, got excited when he raced back with dummy to hand, used treats and experimented with clicker training. Chester 1st Open UK CBRC Spring working test. I kept my training sessions short and light, incorporated them into our walks instead of formulating long static sessions. On the odd occasion when some drill-work was required I punctuated it with play-breaks or moving ground. The single most important thing I learned during this time, however, is that this breed, the Chesapeake, needs acknowledgment for a job well done. Whether that acknowledgment comes in the form of an affectionate pat on the head, a much prized piece of liver or an all out ‘yippee’ and roll around in the grass the choice is yours. To get them to play your game your way they like payment but the best thing for you as a trainer is that you get to break and bend the ‘rules’ and have F.U.N…. You’ve got to be brave enough to break the ‘rules’. When you understand this and apply it in training, it is a tool that can be used to huge advantage when trying to get the best from your dog. 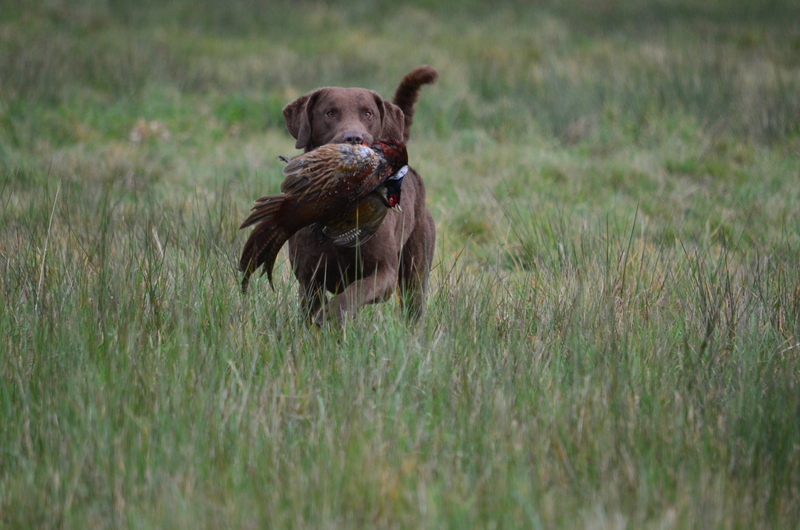 All of those wonderful traits that make a Chesapeake exactly what they are and differentiate them from other retriever breeds, were what I wanted to bring forward and keep, as well as a trained gundog. To do this successfully I realised I, as a trainer, had to change in my approach to training more than my dog. If you are the type of person that likes control and a dog that will bend to your bidding then perhaps a Chesapeake is not the breed for you. That strong-minded, independent thinking dog with a phenomenol nose was bred that way for a very good reason. 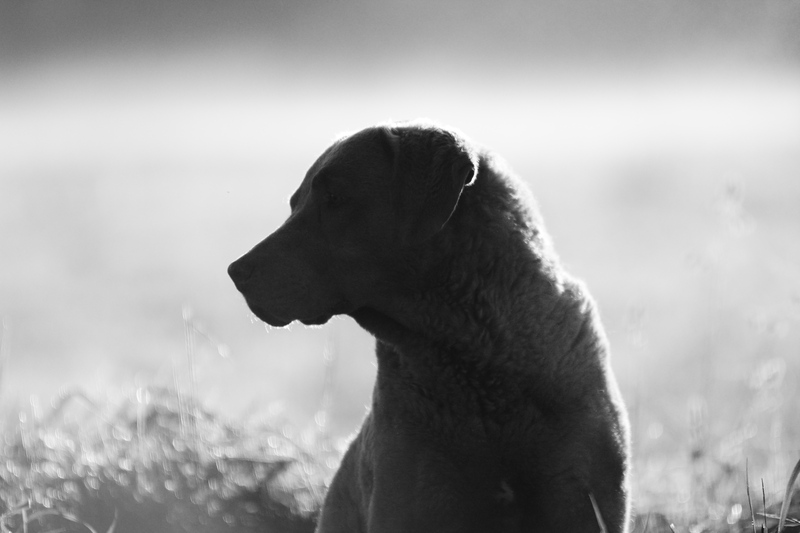 When hunting heavy waters at dawn and dusk a dog with a very strong desire to hunt and retrieve with little direction and repeatedly enter cold water was and is required above all else. That same independence in thinking is often seen as a handicap when trying to teach the finer points of handling. Try to ‘break’ that strong mind to fit into your regime of training and you will surely fail, frustrating both you and your dog. 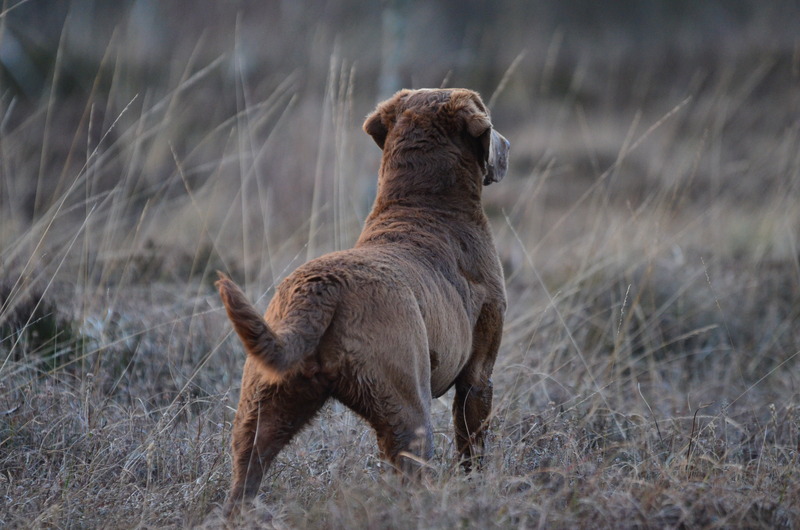 However, if you are willing to understand and apply the heritage that this breed brings with it and change your own approach to training then and only then will you and your Chesapeake break boundaries in training. some success winning WD, WDX and WDQ in the same day with Winnie and her son Bertie. 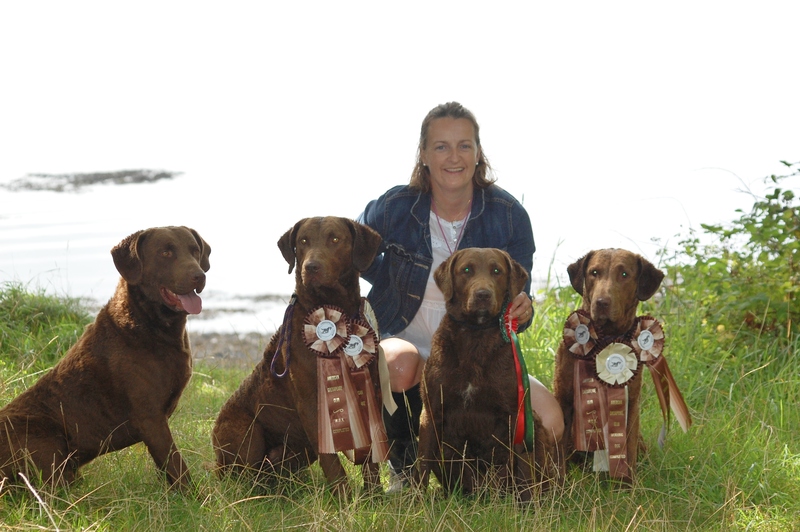 Less than a year after ‘correcting’ myself as a trainer Chester won the Open Class UK Chesapeake Bay Retriever Spring Working Test and in subsequent years I have enjoyed some success with Winnie and her sons Bertie and Mossy. Uisce, now just 2 years, has probably benefitted most from my changes and approach to training. I’ve certainly enjoyed the journey we’ve shared so far but I am still very much on a learning curve. 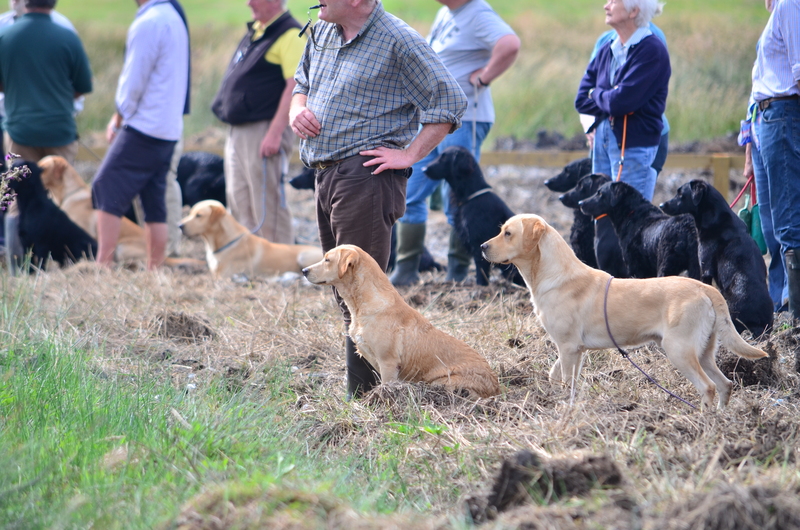 Working tests give me focus for training and although the breeds differ I have learned a great deal from watching some top Labrador handlers compete with their dogs. Getting down and dirty in the working field though is, without doubt, where this breed excels. 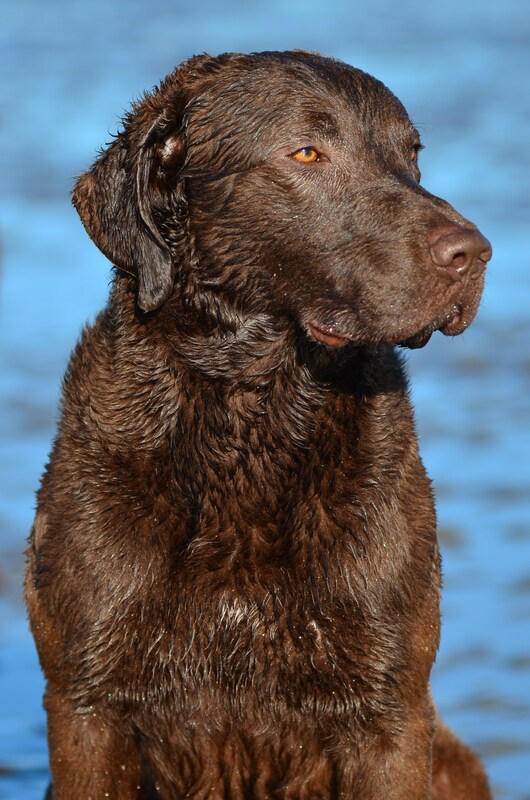 When I can throw off the shackles of lines and whistle work and just let them be what they are meant to be, a strong, solid, beautiful Chesapeake, that is when everything about this breed finally makes sense. The working field is where this breed makes sense. As yet, I have not focussed on field trials. It takes a certain type of dog to compete in this very specialised sphere. Of the many hundreds of labradors bred with field trials specifically in mind each year only a tiny percentage manage to compete with any sort of success. 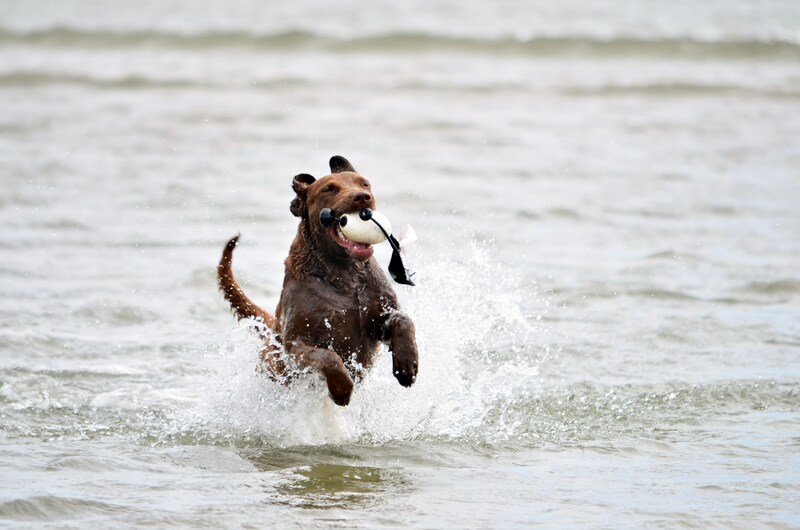 That’s not to say that it’s not possible for a Chessie to compete but to do so would, I believe, take the breed in a whole other direction….for better or worse I can’t say….it’s just not in my breeding plans at present. Beautiful, intelligent, powerful but most definitely not the breed for everyone. So do you still think you’d like to train a Chesapeake? For those of you who still feel this is the breed for you please, please take your time. Ireland is a small country with an even smaller population of Chesapeakes but a disproportionate number end up in rescue or seeking a second home between the ages of 2 and 4 years. Choose a good breeder and keep the lines of communication open for help and advice when needed or, at the very very least, seek advice and help from others experienced in the breed. Good luck in your search whatever path you choose. This entry was tagged dog training, dogs, gundogs, retrievers, short post, writing. Bookmark the permalink. ← Does too much control impede Gamesense? Thank you, glad you enjoyed the read. Oh my, that is absolutely advanced thinking…is it on Facebook, by chance?� So many people just do not ‘get’ this breed, for the same reasons we love it.� Our ten week old new Erin girl is sooo fast to pick up cues — come to name in three days; knows what the poopies or pee-pee’s chant means when taken out to the yard, thinks bouncy tennis balls are heaven and is bright eyed co-operative with positive joy. John, Martha Anne, Macha, and Erin. 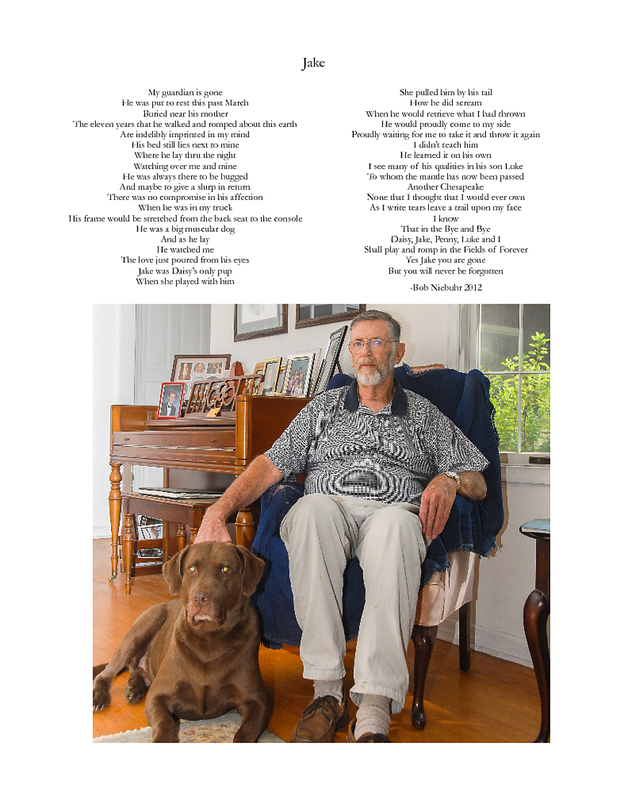 [and in memory of Uncle Cullen] chessiecentral.com dogs — one and all. Great read, we love our Chessie! Thank you, yes they are a fantastic breed. Glad you enjoyed the read. My second “Chessy” is my second Jr. Partner in the dog training business. He see’s the other dogs weakness or shyness and just says come on lets go! It makes my life easier…. Thanks Bill, yes they are a confident breed. Over 40 years ago I told a friend why do you want those “blank” dogs they bite. He just laughed Yes they do bite and yes their love of you is boundless. 15 years ago I got my first chesapeake and have not looked back. What is the dog’s registered name and registery. Thank you Bob, so glad you enjoyed it. The dog in the first picture is my young girl Uisce, Ir Sh Ch Riverrun Caution To the Wind…she appears in many of my blog posts:) and yes she is strong and fast. Great article. We have always worked with professional trainers and I think it is important that they also understand the difference in breeds. I remember when we took our very first Chessie to gun dog training where there were both pointer and retriever puppies in the class. The trainer had all the pups doing obedience work and other basics as a group. Of course our Chessie pup was very bored. I think about week three, the trainer suggested that we come after the group finished. From that point on we went out in the field and the trainer taught our pup while he was actually hunting for birds. 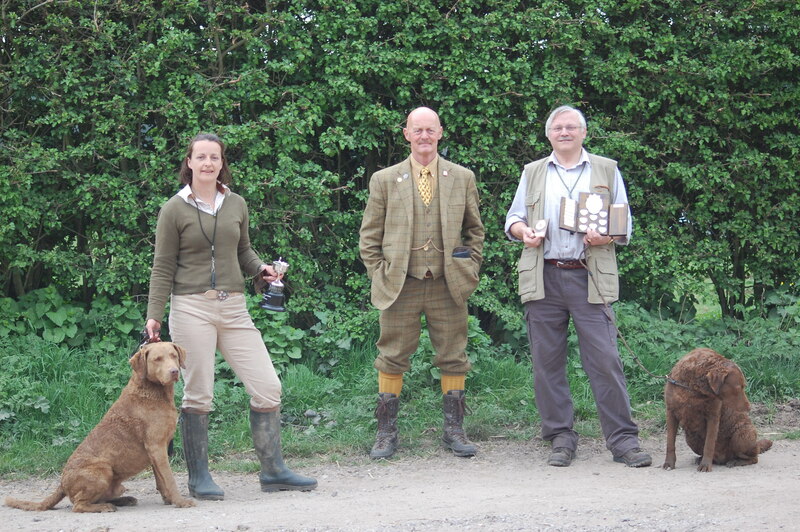 It was so much fun and our dog learned how to be a fabulous gun dog. That was my first experience with the difference in the breeds. Thank you Linda, sounds like your trainer was the type of perceptive trainer we all need more of….btw your blog is pretty cool….love reading about the training set ups. Thank you. The trainer we use for hunt tests is also quite good at working with Chessies. He works with all breeds. He feels it makes him a better trainer because he has to adjust for each breed. Last season he got a Standard Poodle its Master Hunter title. Robert that is a truly beautiful and moving piece of writing…could I share it and credit you on the Chesapeake Bay Retreiver forum? Yes you can. It took me six months to write it. I still choke up when I re-read it. If you like poetry you can find me on poetry.zoo or my web site – kaligula13.tripod.com. Enjoy! If you go to poetry.zoo go to anthologies. The Irish are well represented. perhaps that’s where I get it from. Lol yes we Irish always have been very lyrical in our poetic musings:) Thank you. thank you very much for this great read!!! Thank you Dani, glad you enjoyed it. I am not a hunter and have never been interested in competitions, but I have owned and loved Chessies for nearly 30 years. Your article is spot on. Why force a dog to do something it wasn’t bred to do, especially when it’s so much more fun to train while out for walks or during play time? But what about gender differences? Do you train males and females differently? We’ve had a harder time with males. We’ve always spayed/neutered our brown dogs, so it’s not hormones. Our boys take a lot longer to settle down and learn the ropes. My current boy dog, at 6 years old, is still much too energetic in the house, while our females have usually been pretty well behaved by a year old. We can tell that he *wants* to be good, but he’s just so excitable. Any ideas? If and when the poem is printed. Please send me a copy of the forum orit’s url if you can. You wrote that with great truth, accuracy and honesty. I always enjoy reading your blog! Thank you Misty shores, glad you enjoyed it.